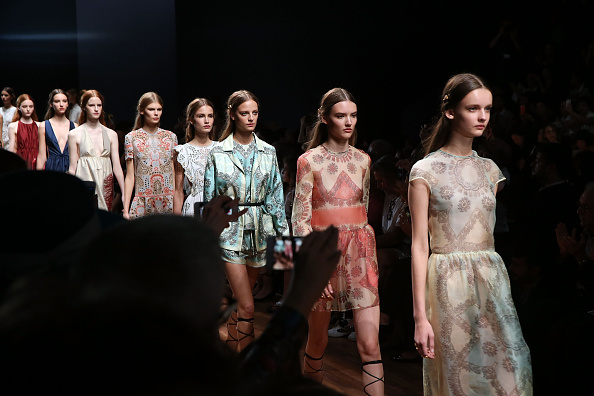 At the gorgeous Jardin des Tuileries in Paris, France, Valentino presented a sleek prêt-à-porter (Ready-to-wear) Spring Summer 2015 collection full of signature prints and luxurious colours. For Spring Summer 2015, Pierpaolo Piccioli and Maria Grazia Chiuri of Valentino took us on a grand tour of Italy during the 18th century which was in-keeping with their trademark sumptuous with a bold bohemian aesthetic. Pinafore dresses were narrowly cut leaving sides exposed. Expert craftsmanship could be seen at every turn, from the laser-cut skins to the lace insets and Broderie Anglaise. A beautiful romance is the overwhelming feeling that the ethereal chiffon gowns gave as they were elegantly draped, printed and embroidered with the utmost attention to detail. Whimsical underwater references were evident in the starfish and seahorse motifs, as well as, coral prints alluding to archives from the late ’60s. Valentino’s designs are often described as very fairytale-like and the collection affirms this. Princess collars, broderie, light fabrics, silver-beaded technique, lace, multiprints and saturated colours that dominate the runway as if blooming into spring from the original dark pieces. Dreamy patterns inspired by oceanic marvels like coral and seahorses decorated some later, more summery looks. The series of designs and the way Valentino chooses to present them is very clever and tells a strong story and takes us on the journey as the viewer. Elegant and utterly romantic looks that make us long for the summer season! This entry was posted in Trend Reports and tagged maison valentino, Maria Grazia Chiuri, paris fashion week, Pierpaolo Piccioli, spring 2015. Bookmark the permalink.